Preparing for the Final Descent! 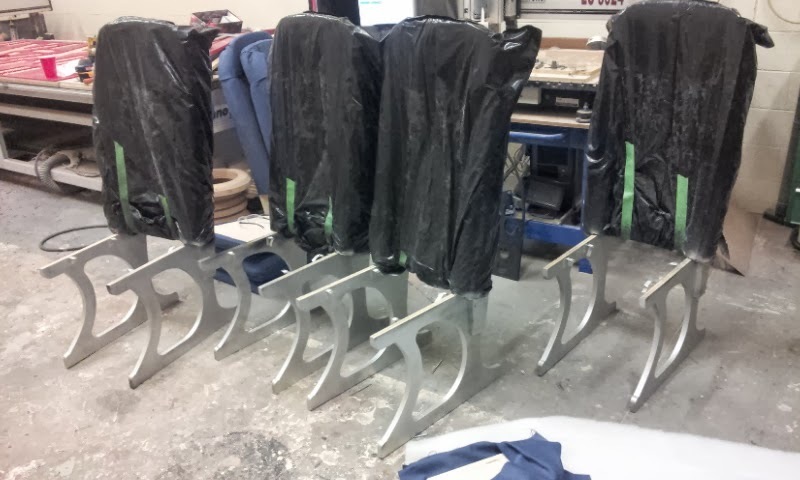 All of the plane seats framework was to be a silver powder-coated look. 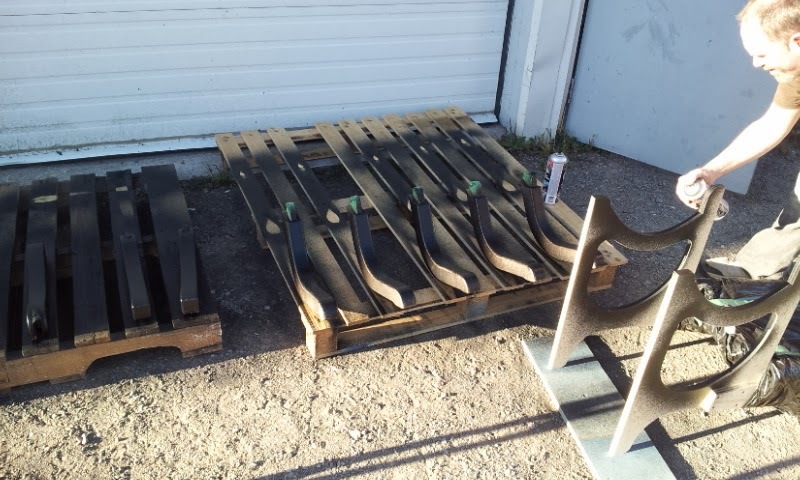 John took all the pieces outside to take advantage of the suns amazing drying capabilities! The framework got sprayed with the awesome hiding capabilities of a rubberized textured automotive undercoating. A couple of coat's completely hid the sketchy edges of the plywood. 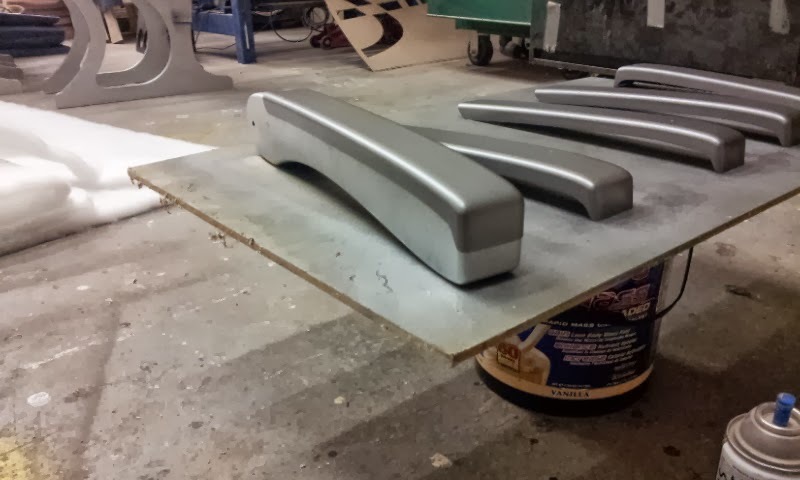 Once the textured coating had thoroughly dried, they all got sprayed in a bright silver metallic color. 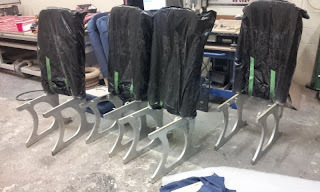 I sprayed the vacuum formed armrest caps out in a darker charcoal metallic. It was enough of a contrast to make them readable, but not garish! I did each piece of the fabric all the way through, one at a time. It became apparent, early on, that in order to not forget how I did each piece, I would do the same piece for each seat, then move to the next one. We had to paint the chair frames after the upholstery work was finished on the backs. It was kind of a chicken or egg thing, but that's the way it worked out. The final seats looked great! A lot more comfortable than last years trip to Mexico, that's for sure! The large X's were next on the list. 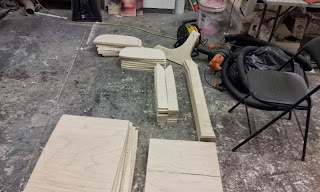 I drew all the vectors, and measured the miter for each side piece. 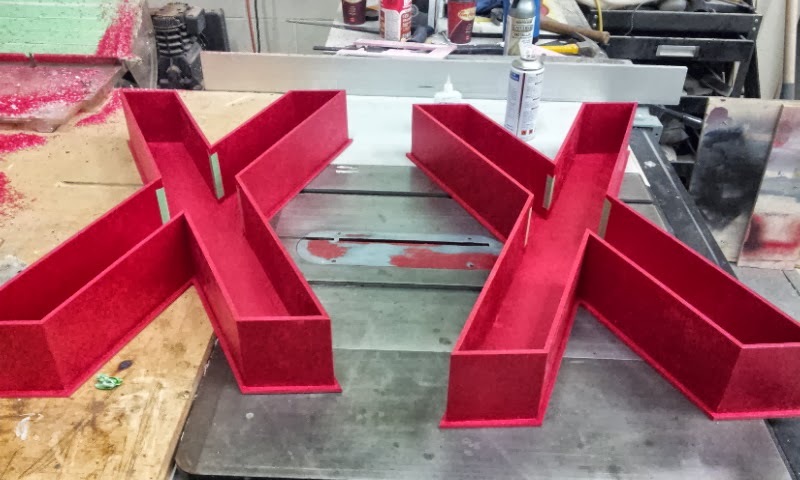 I went with red pvc, so I wouldn't have to do any painting on these. Plus it won't be noticeable if they get dinged during the shoot. Our Techno cut all the fronts, backs and sides for them. 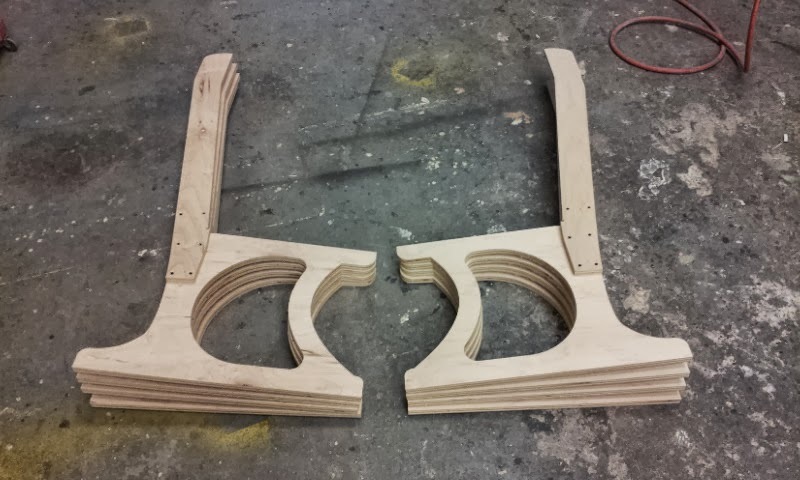 The side pieces all got mitered on our custom mitering jig that uses a small laminate trimmer to route the edges to the desired angle. 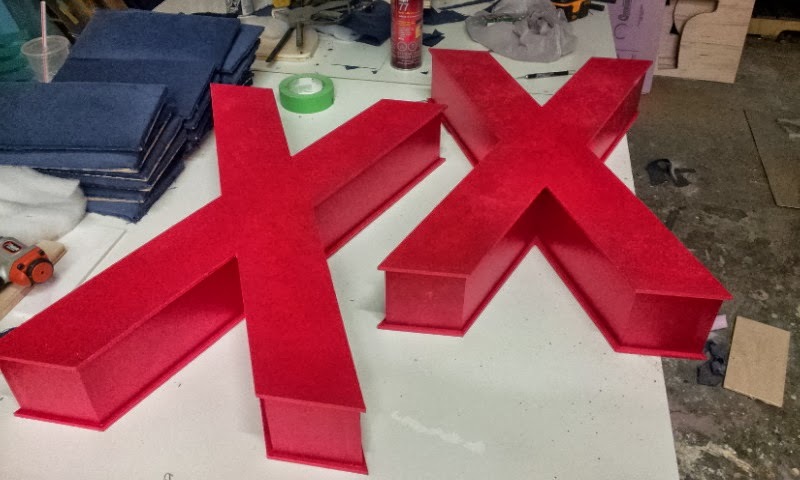 I cut the faces of the X's .250" larger than the final size. 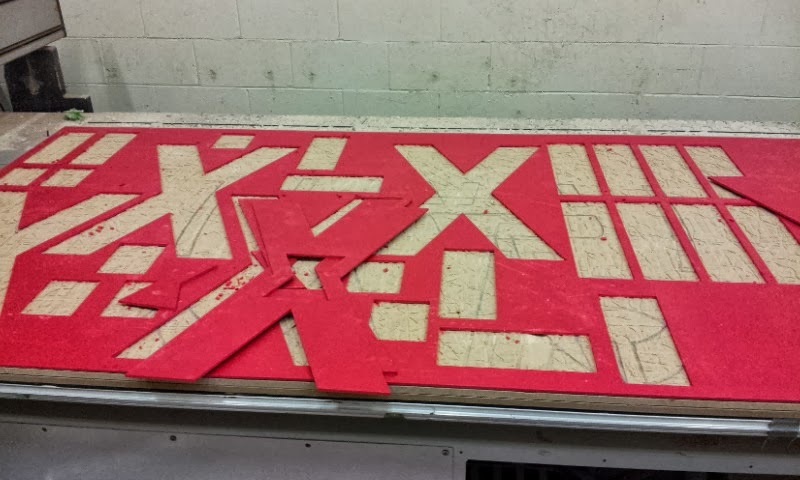 I scribed the offset all the way around the X, and lined the sides up to the scribe. This would hide any small errors that can compound. 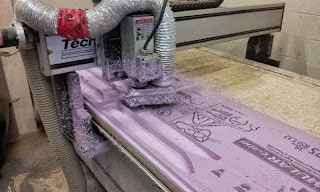 When the front and back get routed with a flush cutter, it will almost be seamless. 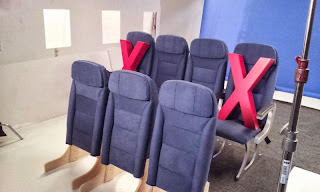 The final X's look great sitting on the seats! 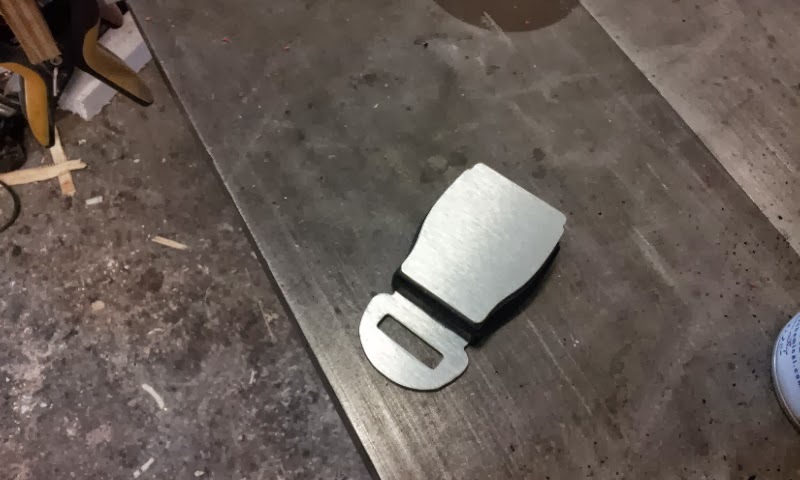 A last minute finalized request was 4 seat belt buckles. I had to think fast how to build these, as we had no time to 3d model and machine anything. I downloaded a pretty clean image of a seat buckle, and knowing the dimensions of the webbing we'd be using, scaled the buckle to the appropriate size. It was basically two pieces of brushed Dibond, sandwiching a piece of 3/4" black pvc. I'm not sure that they'll actually end up seeing these at all, but at least they're there! We got the seats to the studio, and all set up for the pre-light. 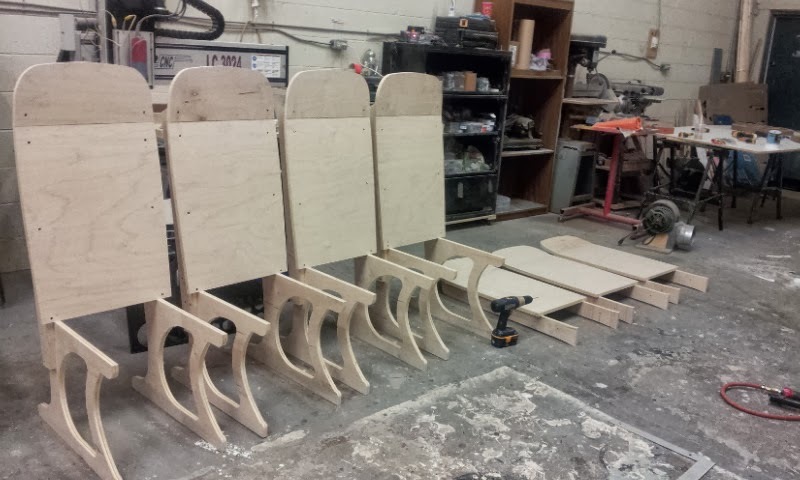 We made the heights of the front row of seat-backs adjustable. This will give them the most amount of flexibility when they start shooting. I pretty much went straight to bed when we got home, and slept really well! Which is good, because the next project is another 7 foot tall cartoon shark! Please Fasten Your Seatbelts for take-off! First and foremost, I am very pleased to announce that Techno CNC is under new ownership! The people at Techno, especially Roy Valentine and Dee Loebl, have always been amazing to both Jody and I, and I feel like they have become personal friends now! We especially wish Roy the very best in his new venture!!!! Now that our crazy schedule is back to normal, I have some time to breathe, and have been able to invest some time into my other growing obsession hobbies! We finished the grueling Zerby Derby schedule, but were thrown head on into the next build. 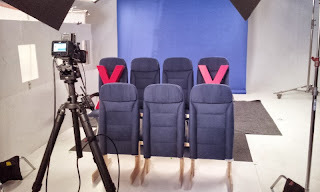 Our client wanted a set of airplane seats for an in-studio print campaign. This build consisted of 4 modern commercial jet-liner seats, as well as three seat backs that could be placed in-front, so the camera looks through them. 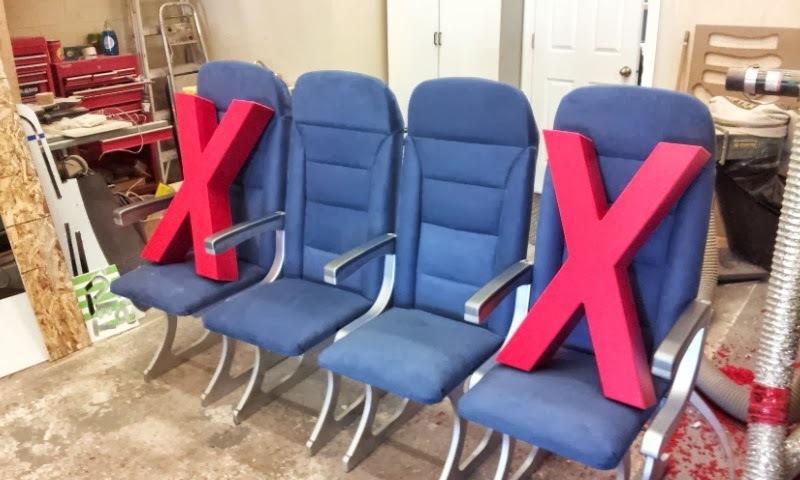 They also wanted 2, 3-dimensional x's that were clearly representing unavailable seating for some reason or another. The X's were the least of my concern, so we threw ourselves head-first into the seating portion first. I modeled the above seats as a build guideline, but we really wont be doing much 3d machining on this. Most of it will be carpentry and upholstery work. One of the things with being involved in custom prop fabrication, is that you kind of have to know all kinds of various methods to get a job done. 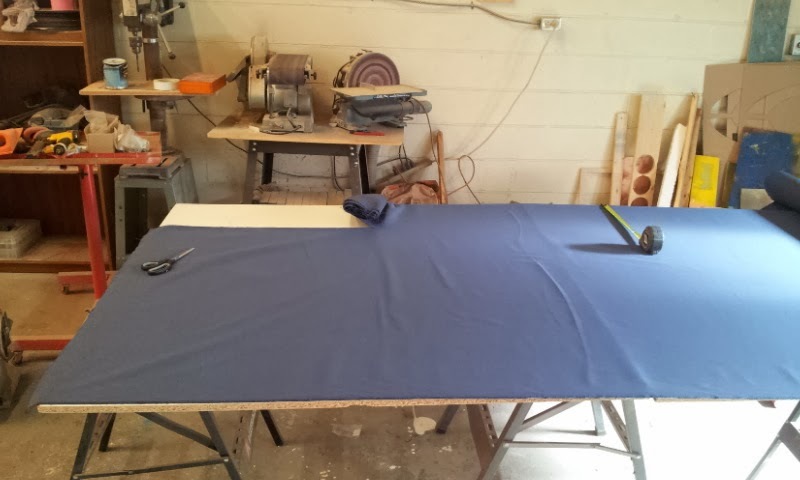 I took the time to learn how to sew, and work with fabrics a long time ago, and it has certainly paid off over the years. I exported the 3d model out from Hex, and brought it into Corel for drawing clean vectors for final export to Aspire. With the vectors all toolpathed in Aspire, the files were sent off to our Techno. Were building the frames from 3/4" maple ply. This is my plywood of choice whenever I can use it. It's got a great skin on both sides, is really lightweight, and machines pretty cleanly. It wasn't too long before the parts started coming off the Techno! 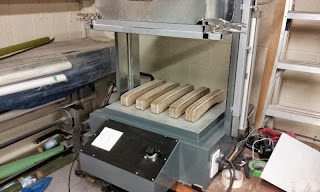 I ended up splitting the frame base off the back support so I could get the best yield of material. I popped a couple of locating holes in each piece, making assembly quick and accurate. The arm rests I cut from 3 layers of 5/8" mdf, and Jody sealed the edges with 2 coats of waterbased urethane clear. 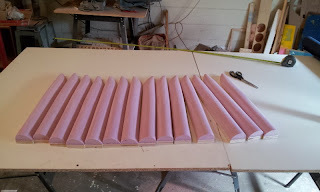 Out of all the products I've used, I have great luck using the urethane as a sanding sealer for mdf. It dries almost as fast as a lacquer, and sands up just as nice. 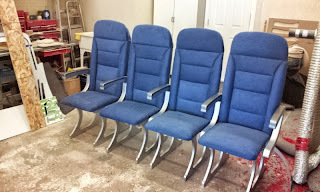 I hinged the armrests as well. They probably won't ever fold them up, but this will give them the option if they choose to use it. In the initial render, and as per the reference of the CG plane interior, the arm rests have the caps on them. It was almost a no-brainer to vacuum form some .060" PET-G over all 5 of them. 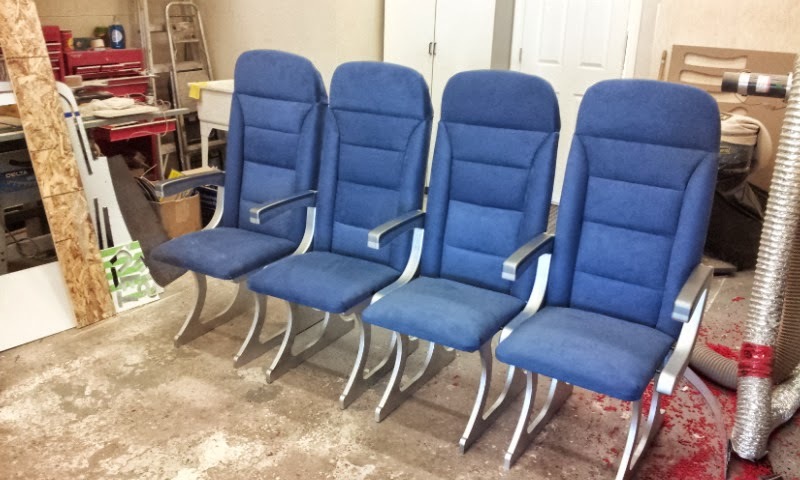 We'll trim these out later, and they'll be perfect-fitting caps for the arm-rests! 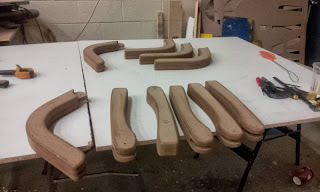 Pulling the vectors for the lumbar portion of the seat, I quickly used the 2 rail sweep in Aspire to generate the shape I needed, based on the 3-d model I did. I could have used the 3d geometry from Hex, but I wanted it to fit 110% the plywood support it sits on. And as the 3d model was a guideline for the vectors in Corel, I couldn't be sure it would all work out. Once the first shape was created, I added a fade to the entire shape. 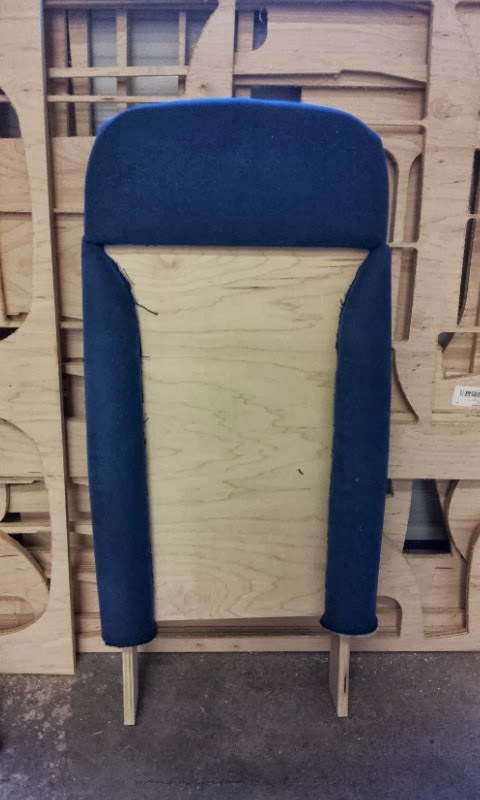 This will gradually flatten the overall shape towards the top. A quick mirror, then I copied it to get the quantity I needed. I went with 2" insulation board styrofoam for the actual pieces. 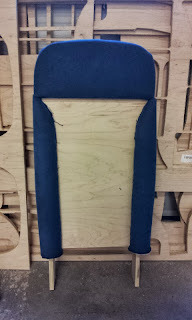 We'll be upholstering over this, with some padding as well, so it's just a rough shape. All 14 pieces took around 20 min to cut on the Techno with a 1/2" bit. 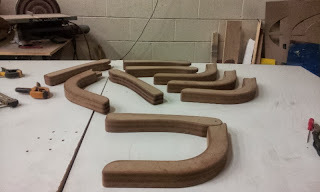 These eventually got spray glued to the matching plywood backer. 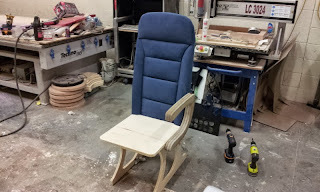 The backer will let us screw this, and all the other pieces to the chair shell. This is the bare seat assembly. Everything easily clicked together. 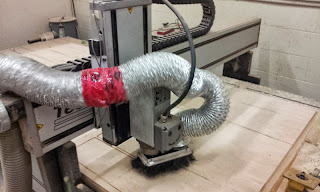 I'm getting much better at remembering to employ Aspire's "Dog bone" fillet feature, which also speeds up assembly.